As the Moonstone Islanders settled onto their new homeland, Jerdana offered to show Nera what all they had built. Wonder what they all hold? 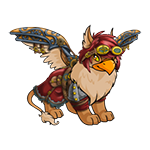 Eyrie Day has arrived and an amazing way to celebrate this joyous holiday is by giving your Eyrie a complete make-over. In a lot of ways, beauty is in the eye of the beholder and true beauty can only be found within, but when you hit the neoboards and everyone starts laughing at your basic Green Uni those ideas go right out the window with your self esteem. 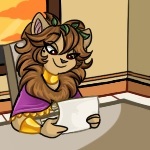 But what are you to do if you do not have a lot of neopoints, you spend your afternoons at the Soup Kitchen and a splurge treat for your pets is a single night at the roach hotel? He can't make up his mind, mind, mind, mind, mind.